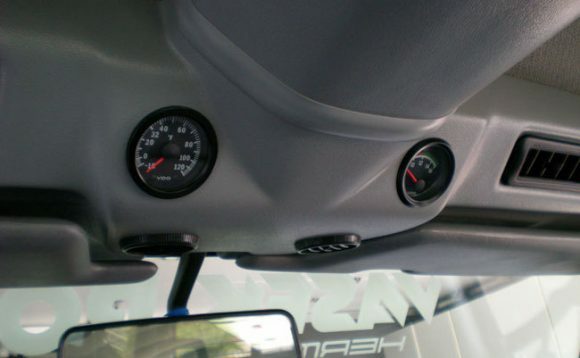 File this one under more Vanagon gauge placement ideas. This owner decided to put a couple of gauges in the A/C duct. What a perfect place to have them available, but out of the way. One thing is for sure, these gauges will never overheat. 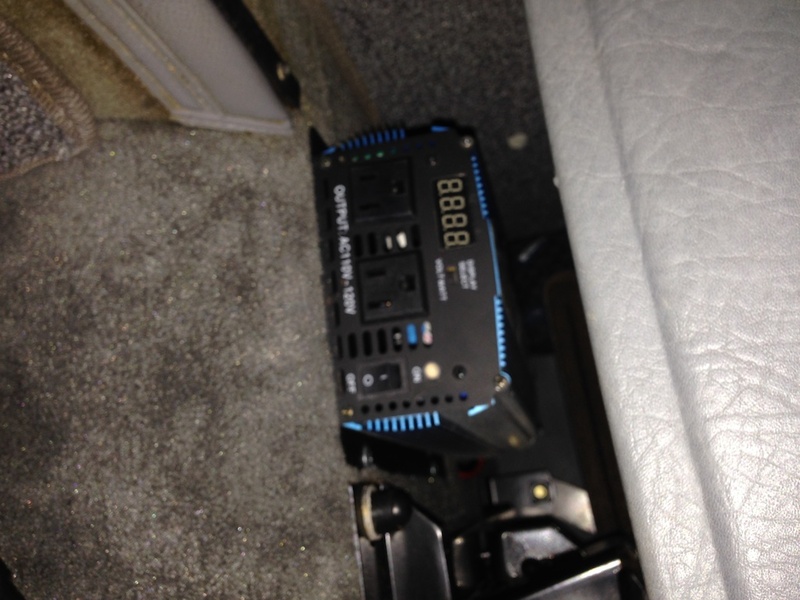 One of our favorite additions to the Vanagon is this Power Bright Inverter. It allows us to plug in laptops, chargers, rice cookers, coffee makers, or anything else we can imagine. The Power Bright Inverters come in various sizes but we chose this 1100 watt version. It rocks! You can pick it up here and have it shipped right to you. We tried several inverters but most of them include a loud fan. The Power Bright runs well and is very quite. In our Carat we mounted it behind the driver’s seat. In a Westy camper you can mount it to the cabinet. This Vanagon owner did some work on his cluster. 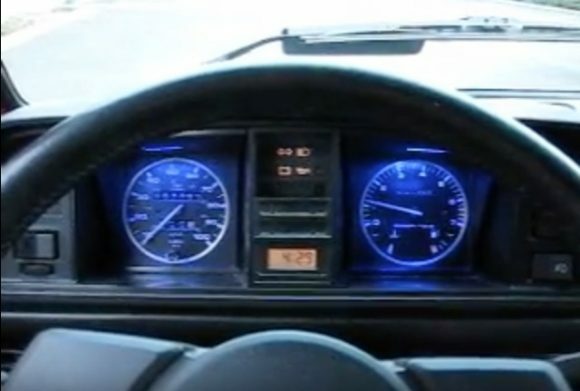 He added trim rings to the speedometer and tach and added blue LED backlighting. What a nice upgrade to the dash! Click through for a demo video of his installation. What do you do when you want to re-heat your food while on the road? 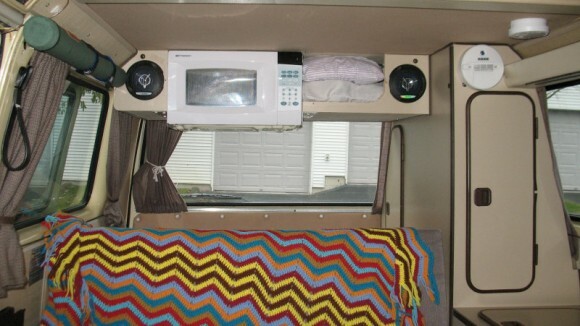 You install a microwave oven in your Vanagon, of course. 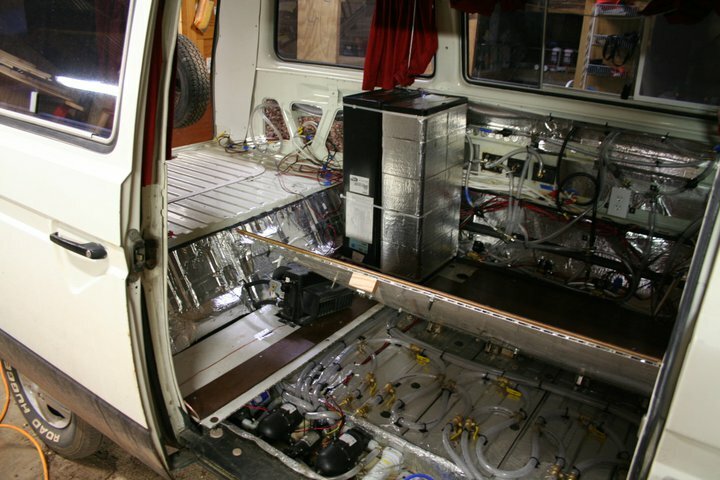 Tom Boldway installed a 700 watt microwave in his van after his air conditioning stopped working. He decided to use the space above his bed for the microwave. If you don’t need air conditioning this works great. Get another pic and instructions after the jump. 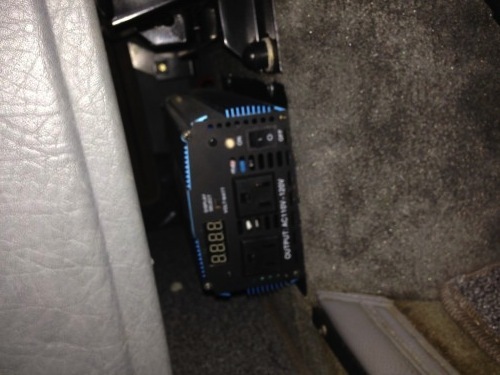 If you read this blog often, you know we just installed 3 US12220 battery equivalents in our van. We couldn’t get the actual UB12220, but we installed PowerSonic batteries in the same formation. The Samba member, westyventures, did one better by installing 4 batteries, and his installation looks great. Click through for more. Brad and Sheena own a Vanagon they call Nacho. They decided to quit their jobs and drive Nacho around the globe. 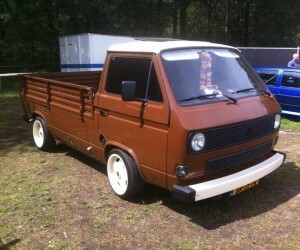 They spent a lot of time customizing their Vanagon and as you can see, they have done quite a job. Brad designed a water filtration system that is insanely good. He uses UV lighting and a 0.2 micron filter to make sure no matter what water he puts in the Vanagon, it comes out clean at the tap. On top of that, Nacho has separate hot and cold water tanks. Click through to see how they did it. 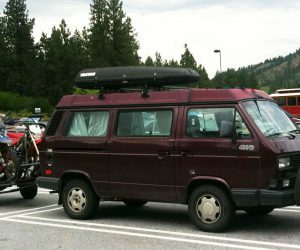 One of the best things you can do to your Vanagon is install GoWesty’s Auxiliary Battery Kit. 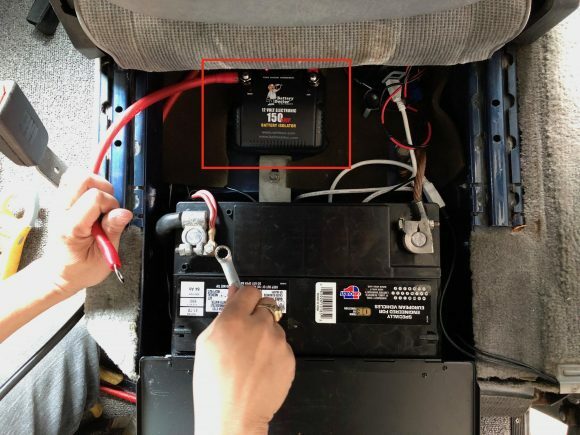 Once you have that done, you might consider this battery hack we first got from Ken at Van Again. 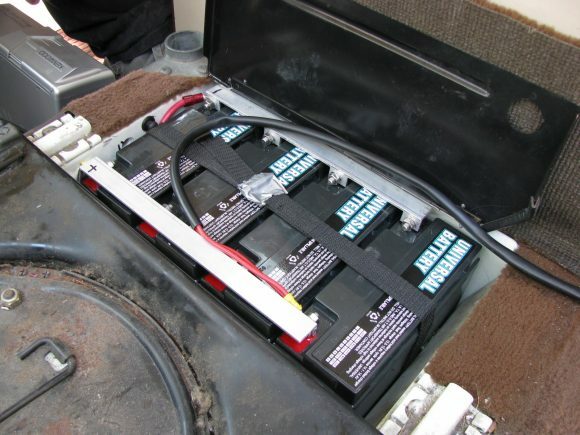 He put 3 motor scooter batteries in parallel to get more amp hours out of the setup. We followed his lead and it works great. 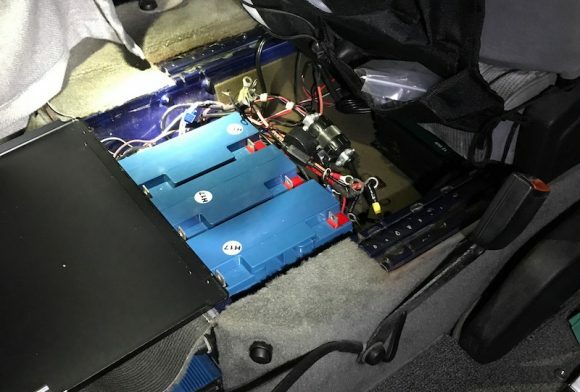 He used 3 UB12220 batteries to get a total of 66ah. We had to settle for 3 Power Sonic 21ah batteries to get a total of 63ah because nobody would ship the UB12220 batteries to Honolulu, but we are totally happy with the setup. The Vanagon cigarette lighter is a quirky part of the van. It gets loose and easily breaks after repeated use. 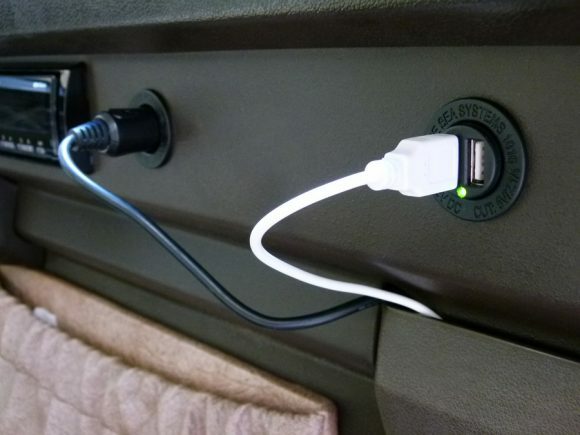 We have shown you how we strengthened our loose cigarette lighter plug, and we use USB adapters to charge our equipment, but Camp Westfalia has an even better idea. They have published a step by step guide to show you how to install a permanent 12 volt USB plug in place of the lighter. Click through for more. 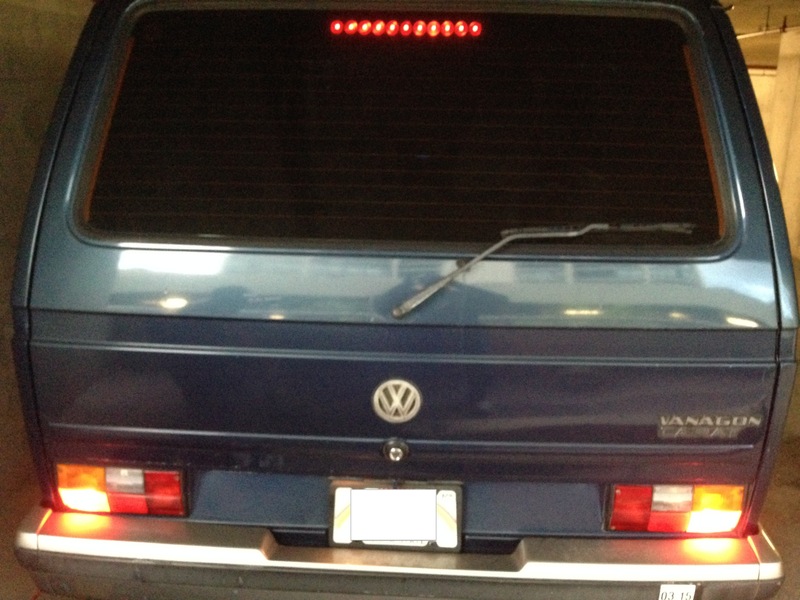 We found a LED brake light online that was wider than the version GoWesty sells. This light did not stick to the back window with double stick tape so the challenge was figuring out how to mount it. We thought about mounting it to the back hatch, but that would mean drilling into the hatch and leaving some exposed wire. We opted for mounting the light on the air conditioner’s evaporator housing.